When a dog is happy, it wags its tail. If you try to wag the tail for the dog, it does not make the dog happy, it’s not the same thing at all. You cannot force happiness by waving a tail around. The same is true for actually winning someone over to your way of thinking. No amount of waving around “facts”, “reasons”, or “rationale” will get your audience to align with your side. You cannot state a rationale that makes sense to you and expect it to move someone else unless you’ve done the hard work of building trust and rapport with that audience first. Every salesman knows this already, it is no secret, so why is it so hard to accept in other realms of “selling” ideas? When it comes to politics and morality, we think we are more rational than we are. In order to get to the rational, reasonable parts, we must- at first – ignore those factual arguments. What follows is a proven method for persuading someone to your side – which may or may not be the same thing as “winning” the argument. Jonathan Haidt came up with the idea about the dog’s tail illustration in his book, The Righteous Mind. This book helps explain why we think, talk, and act the way we do. He explains that most of our behavior is unconscious, but we are really good at supporting our gut instincts with reason post facto. His writing is part of a movement in cognitive psychology, based on scientific research, that disputes the ideas from the Age of Enlightenment. This movement began in the 1600s with Isaac Newton, John Locke, Voltaire, (among others) and the broadened use of the printing press. It was about people educating themselves and throwing out superstitions – especially those that kept the common people oppressed and under the thumb of church and state. It assumes broad ideas about how humans are rational beings if they are just educated. The ideas born in the Age of Enlightenment are so ingrained, they were written into the founding documents of this country. Rejecting the ideas from the Age of Enlightenment are paramount to rejecting the idea of gravity, but cognitive psychology now lets us know that while me may think a particular way about a subject, how we actually intuit and behave around it could be an entirely different animal. Like…an elephant. Haidt uses the illustration of an elephant and a rider. The elephant represents our emotions, our intuitions, our subconscious. The rider represents our rational selves. The rider gets to know the elephant very well, and may even be able to guide it, or convince it of something if it makes a big effort, but that elephant is going to do what it wants – especially if the rider is just along for the ride. In this analogy, the rider may also be able to explain to others why the elephant behaved as it did, maybe it can even warn others in anticipation of what it is going to do, but the elephant never asks the rider permission – it just knows what it wants and needs. Now imagine trying to win an argument with an elephant by citing facts. It is likely a comical scenario you just conjured up. It doesn’t mean you can’t win the argument, it just means that you have to put the argument in terms an elephant can relate to, and you have to establish a relationship with that elephant – they must trust you. When we engage others in trying to “win over” someone to our side, we tend to try and talk rider to rider when we -as the conscious rider on our own elephant – need to be talking to their elephant. If someone starts an argument with you by telling you how wrong and stupid you or your opinion is, you generally have a low opinion of that person from the get go. The chances of that argument actually moving anyone to change their position is next to zero. However, this is the norm in our society. We state our outrage and indignation first – many times in an insulting way because the “wrong” that has been done to us is so offensive. Perhaps expressing outrage is in order, but don’t expect that to be the intro to a persuasive argument. So, what is the secret to winning the argument? Well, it depends. If you measure “winning” by shutting the other person down, ignoring their points and talking over their responses then keep doing what you’re doing. If you need your opponent to grant you a “you won” verbal trophy at the end of the argument, you may be waiting a very long time. So if you need to be told you are “right”, you may never win an argument in that way. If your objective is persuasion, keep reading. If you define “winning” by having a meaningful conversation, fully listening and engaging the other person, by learning new perspectives and gaining respect for your opponent – and they for you – then you have an excellent chance. Along the way you may make a friend and turn someone from being hostile to your ideas, to understanding why you hold them as important. The magical thing is that this “opponent” will then be an ambassador for your ideas to their friends – even if they don’t fully adopt them. The next time the touchy subject comes up and a cohort wants to “bash” the other side, your previous “opponent” will say something like this, “well, they’re not all like that. I can imagine being in that position and wanting _____.” I’ve seen it demonstrated many times. Also, to be clear, the “elephant analogy” that Haidt uses was not chosen to represent any political party or ideology. He used it because elephants are big and powerful, but steerable. The concepts explained do not pertain only to convincing conservatives to be liberals or any specific configuration of ideology, they can work from any starting point. Of course, in reality there are those closely guarded elephants – we recognize them as loyalists or stalwarts. 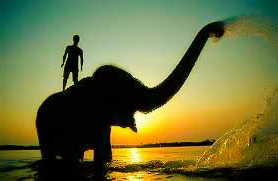 There will always be people – or riders of elephants – that will not let their elephant within miles of you. This could be an idealogue, someone sequestered in an exclusive social culture, or someone who consciously protects themselves from any outside influence. There are always going to be people that will not engage and no amount of elephant whispering will be received, but most of us are just going about our day and are willing to engage with friendly folks. It starts slow…with a smile. Push your urgent need to be “right” away for a moment. Try the other persons ideas on like a jacket, to see if they fit (you don’t have to tell anyone you entertained the idea). Find out what is important to them, then imagine how to approach the subject from that perspective. We are great at creating “reasons” and “justifications” at the drop of a hat, we invent them all the time to cover our own butts (elephants/moral judgements). We all know what it’s like to feel something intuitively, “I’ve got a gut reaction…”, respect the fact that your opponent may have that about your current perspective. No amount of convincing them through reason will change their intuition – unless they change their gut instinct about YOU. Read other posts that relate to this concept in The Facts ALWAYS Fit the Frame and What’s the Big Deal About Values (or V.I.P.)? And as reasoning is not the source, whence either disputant derives his tenets; it is in vain to expect, that any logic, which speaks not to the affections, will ever engage him to embrace sounder principles. This is so true, progressives always think that facts will win their argument – and facts never win. Then they are always disappointed. We need to learn how to make arguments from emotion and appeal to that level using the facts as a basis for the emotional appeal. We can still tell the truth but we need to learn how to tell those facts in an emotional story that grabs people’s hearts first. Sorry to say it but we need our own Frank Luntz. And Progressives need to get on the same page and begin the process of repeating our talking points over and over to get our frames embedded into the daily dialogue – and do it first! We need to stop being reactive and be proactive. Melissa Harris-Perry gave a great example when she said to never ever use the word abortion. It is a word that just drives people into corners from which there can be no thoughtful discussion at all. She says she always uses words like pregnancy termination or something else like that. And there are many other things like that where using different words changes the emotional reaction. Who is Worthy of Love? Click on any category for more articles.